I was made to hate Hello Kitty. You were made to irritate me. HK KISS dunny paper. What next? Uf, I didn’t know what to waste money on anymore. might be a dumb question but who is Kiss? and what does the hello kitty toilet paper actually look like underneath the wrapping? i might want- if it’s truly cute enough! Yes, a collaboration between KISS and HK is a match made in sell out Hell. 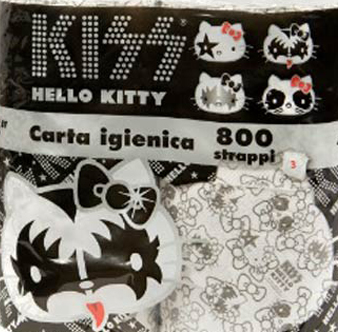 Gene Simmons (bassist for those not familiar) will put the KISS name on anything, just like Sanrio with HK. KISS Kasket, anyone? Not a fan of KISS, but something about this just brings a smile to my face, lol! Double WIN!! as you get to rub your $h!t in both HK’s and Gene Simmons’ faces at once! @Sanriobaby – You are so right in your July 26th at 7:47PM; Gene is enough of an @$$hole to have sued people who were raising money for charity dressed as K!$$. I have to buy some of this to send To Axl Rose because of all the awful things Gene Simmons said about him!!! I need to find some. Ebay here I come! I want it! 😀 I love this collaboration!